Thursday, February 9th, 5-7 p.m.
“Rooftop: Second Nature draws poetic attention to an important new movement to counter the heat island effect caused by city life. 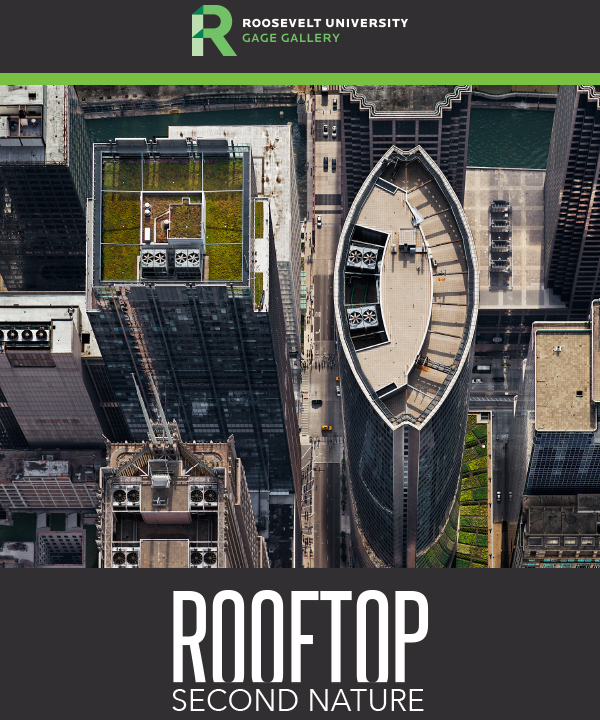 Green roofs reduce our carbon footprint and improve storm water control, but they do far more. They reflect the conflict of our existence, symbolizing the allure of nature in the face of our continuing urban sprawl. The elevated landscapes from the Rooftop series represent the judicious reintroduction of nature into urban settings. The photographs reveal that through grace and ingenuity, we may be able to construct a healthier environment and a more responsible infrastructure. This project, book and exhibition have been embraced by leaders in the field of green architecture, as well as museum curators and collectors. Images have been exhibited in venues in Chicago, Krasnodar, Russia, and the Houston Center for Photography. The photographs selected for this exhibition were featured in Second Nature: A Survey – Photographs by Brad Temkin at the Southeast Museum of Photography in Daytona Beach, Florida with a supplemental display of images from the Rooftop series at the Atlantic Center for the Arts in New Smyrna Beach, Florida. “It is important to recognize that Temkin captures, not an unnoticed feature of the built landscape, but a significant shift in architectural expression. This architecture is a new artistic medium in which nature and humanity contribute equally. It represents a departure from the traditions of the past in which buildings were conceived in opposition to nature.” –Roger Schickedantz, from the introduction to the book Rooftop: Photography by Brad Temkin. and Physical Resources Department at Roosevelt University, with generous financial support from Susan B. Rubnitz and Elyse Koren-Camarra. Brad Temkin is an award winning Chicago-based photographer who has been documenting human and environmental relationships throughout his career in photography. Widely known for his contemporary landscape images, his work is held in numerous permanent collections, including those of The Art Institute of Chicago; Milwaukee Art Museum; Corcoran Gallery of Art, Washington, D.C.; Museum of Fine Arts, Houston; Akron Art Museum, Ohio; and the Museum of Contemporary Photography, Chicago, among others. His images have appeared in such publications as Aperture, Black & White Magazine, TIME Magazine and European Photography. A monograph of Mr. Temkin’s work entitled Private Places: Photographs of Chicago Gardens was published in 2005 by Center of American Places. He has been an adjunct professor at Columbia College in Chicago since 1984, and a lecturer and visiting artist at numerous institutions in the United States and abroad. Temkin’s second book entitled ROOFTOP published by Radius Books (www.radiusbooks.org) was released in the Fall of 2015. This entry was posted in architecture, arts, cities, ecology, education, events, exhibits, green design, humanities, Roosevelt. Bookmark the permalink.